INQUINTE.CA | Community | Obituaries | Hutchinson, Alexander "Jock"
HUTCHINSON, A.P.R. (JOCK) FL.LT.(R). EX..RAF./RCAF. D.F.M. C.D. Peacefully entered into rest at Hastings Manor Long Term Care Facility on Saturday, March 23rd, 2019. Jock Hutchinson of Belleville died at the age of 97. He was the son of the late Harold & Nan Hutchinson (nee Hill) and husband of the late Adrienne (nee Bourgoin). Jock was the step-father to Patricia Fitzgibbon (late Gary) of Trenton. He will be missed by three grandchildren and five great-grandchildren. Jock will be sadly missed by his very dear friend, Grace Grills and her family of Belleville. Jock was a pilot for more than 40 years, enlisting with the RAF on his 18th birthday on Dec. 1939. He served with Bomber Command in Europe and the Middle East arriving in India as the war ended he accepted an offer to remain there for 2 years flying transport aircraft. After the first India-Pakistani war (Aug. 1947), he decided to try civil aviation in Canada. 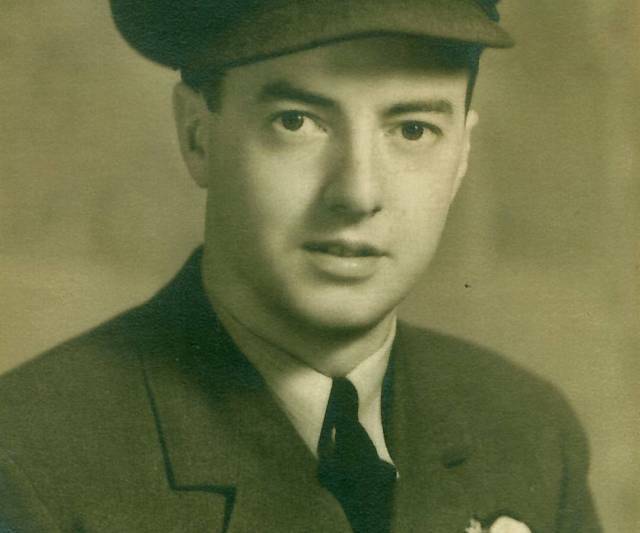 Advised by TCA that he was too old at age 26, he found himself in the RCAF in 1948 and in 1954 arrived in Trenton. After a tour with 426 Sqdn and one year with the UN in Egypt, he was back in Trenton with 437 Sqdn. In 1964, he was suddenly retired when the Defense Minister Paul Hellyer applied a sharp axe to the RCAF. Jock obtained employment with a charter airline in Gatwick and he and his wife Adrienne moved to the UK and he continued flying for the next 18 years. In 1976, they moved to their villa in Majorca. Jock commuted to Switzerland where he flew with a Swiss air cargo company. When 2 aircraft were sold to a Libyan company, Jock went with them, and now commuted to Tripoli. In 1981, when Adrienne became ill, they returned to Canada and settled in the Belleville area.